Then you have to lower the soil pH towards neutral, so you need to add soil acidifying materials like Sulphur. Manutec Sulphur is the most common and economical product available to lower the pH of soils. To lower the pH by one unit (for ex ample from 7.5 to 6.5) use the following number of grams of Sulphur per square metre of soil area depending on soil type. These amounts will lower the pH of the top soil by about 1 unit. To lower the pH value by 2 units or more, multiply the above recommendation by number of units to reduce. 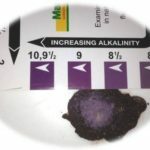 The soils that are naturally alkaline with large amounts of lime stones will have a very high pH value and it will be difficult to lower the pH. Soil pH needs regular monitoring and testing as soils will revert back to their natural pH level. Note: Sulphur is generally not soluble in water. When applied to soil, it is gradually converted to acid and reduces the pH. Hence the actual effect of pH change can be observed after approx. 4-6 weeks. So it is important to test the pH after this period and repeat the application if necessary. To lower the pH of bulk potting mixes/compost by one unit, add approx. 500g Manutec Sulphur per cubic volume of mix i.e. per 1000 liter of mix. You can use Sulphur safely as long as you can mix with soil/potting mix and water well. But not recommended for if you are growing very young seedlings or sensitive plants. Depending on size of the pot and number of liters of soil/potting mix it holds, you can calculate amount of Sulphur required. As a guide, you can use 1 level measure of tea spoon (approx.5 grams) for every 10 liters of soil which will reduce the pH by one unit. For example, to reduce pH in a 12 inch pot by one unit, which approx. holds 10-12 liters of soil, so based on above rate, you can use 1 level tea spoon of Sulphur. However if the pH of potting mix is very high (above 9 or 10) it is better to re-pot plants with fresh mix, rather than using excess Sulphur to reduce the pH in pots. Iron Sulphate is also an acidifying material, however, as it is not as strong as Sulphur in acidity, for use on a larger area or for reducing high pH value, may require large amount of Iron Sulphate, which sometimes causes Iron toxicity. However unlike Sulphur, Iron Sulphate is water soluble and hence provides a fast response to reduce pH and it is a good option for small containers and particularly for reducing the pH slightly and quickly. Use a solution containing 2 grams of Manutec Iron Sulphate per liter of water. Apply about 200 ml per liter of mix & then within 5 minutes water thoroughly to drain excess salt. 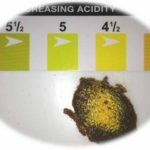 Wait for a week, check the pH, if needed repeat the same. Organic matter when decomposes normally produces hydrogen ions which may help to reduce the pH slightly, so addition of organic matter such as good quality compost, manure and organic products such as Manutec Blood & Bone products or Manutec Peat moss etc. always helps to provide buffering effect and reduce the pH. However caution should be taken while adding new soil or compost to your garden beds as many a times poor quality compost can be alkaline and make the condition much verse. Better to test new compost or new soil prior to use with Manutec pH Kit. For highly alkaline soils, better to use combination of quality organic matter and Manutec Sulphur on a regular basis and monitor pH. Note: Products such as Lime Sulphur you may find in garden outlets are fungicides and are not soil acidifiers and shouldn’t be confused to use them as soil conditioners to reduce pH. So to increase the pH, you need to add Garden Lime or Dolomite. Both Garden lime and Dolomite are effective in increasing pH, but the difference is Dolomite contain higher magnesium levels than Garden lime, and given that acidic soils are normally deficient in Magnesium, dolomite helps to enrich Magnesium levels. However caution to be taken not to apply if you are growing acid loving plants such as azalea, camellia, Rhododendrons etc. To increase the pH by one unit (for example from 5.5 to 6.5), use the following number of grams of Lime per square meter area depending on soil type. These amounts will raise the pH of the top soil by about one unit. To increase the pH value by 2 units or more, multiply the above recommendation by no. of units to increase. The soils that are naturally acidic needs constant monitoring & checking . Raise the pH of mix with a suspension of Lime by dissolving 5g lime (heaped teaspoon) in a litre of water. Pour the suspension onto the mix in the pot. Use 200ml for each liter of the mix. As a guide a 130 mm pot contain 1 liter of potting mix. If the pH is too acidic (below 4.0) it is better to do re-potting with fresh mix. Note: Before you adjust or alter pH of soils/potting mixes, check the pH requirement or preference for the plants you are growing so that you can change the pH accordingly. In many cases, when we plant and if they don’t establish and grow, we blame ourselves on lack of garden skills, but in reality it could be due to poor soil health or poor pH etc. Important note: Industrial Lime products such as QUICK LIME OR HYDRATED LIME (BUILDER’S LIME) may not be suitable/recommended for garden use and hence caution/advice should be taken from experts while using them as they are very caustic and tend to influence pH very quickly.